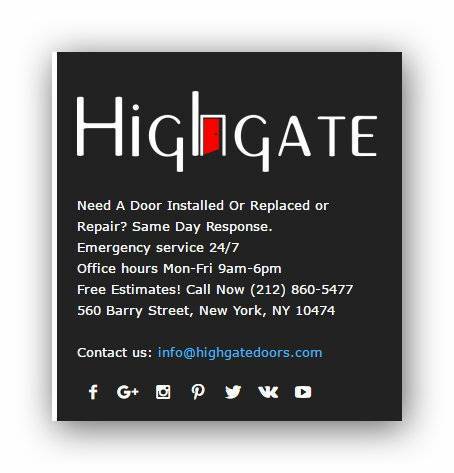 We built a website from the bottom up for New-York-City-based Highgate Doors, which offer a wide variety of door repair, including commercial doors. They have fixed doors for many large stores in New-York City. The company is clearly a leader in its industry, and we developed a web design that reflected its expertise, good sales volume, and the potential for growth. The redesign was unnecessary as the New-York City company did not have an existing site. We can do the same for you. Call us toll-free (844) Geek-NYC (844) 433-5692. Our web design was aimed at establishing a great image for the New-York City business, offering interaction with customers, making the site eminently searchable through effective SEO, and advancing the effectiveness of its digital marketing. Here’s a more detailed look at some of the actions that we took to produce a highly efficient web design for New-York-City-based Highgate Doors. As a start, we designed an original logo for the New-York City company. Placed on the website, the logo gives the company a professional look and is readily identifiable, thereby promoting its brand. An additional benefit is that the logo can be used in other ways for the company, such as on signs, paperwork, and flyers. Our New-York city staff took numerous photos to illustrate the site, which lent itself to action photography. The pictures illustrate real people at work, portraying a company whose employees work hard and are kept busy at their main job of repairing doors. The photographs served not only to draw viewers into the site but also to retain their interest once they had landed on it. We developed and placed numerous videos on the site, which also enabled us to keep people’s interest in the site and pushes up their time spent on it. A lot of people do not like to read too much on the web, and a video is an easier method for them to take in the information that is being conveyed. A video spokesperson also helped us to create a video that served as an advertisement for the company. We made it possible for viewers to contact the company in many ways. Among those ways is a green button on the site. By clicking on it, they can talk to the company representatives at any time, or leave a message if they would prefer to do so. They can also chat with representatives through the website. Because the website is mobile friendly, it can be read on a smartphone, a tablet, a laptop, or a desktop computer. The site looks slightly different on the phone, but the information and the message it conveys is the same. The site scores high on all the Google tests, whether it be for SEO or speed. Its keyword ranking is high. So much so that it scores number 1 on almost all items relating to door repair, a field in which there is huge competition. Our web design services will greatly enhance your business internet presence. Call us toll-free 844 Geek-NYC (844) 433-5692.